2nd. Day - Breakfast at hotel. • Stay at the Burcu Kaya Hotel 1 night. Further to the time for lunch proceed to Goreme Open Air Museum to visit the churches, chapels and monasteries carved into the fairy chimneys from the 10th to the 13th centuries with frescos painted on the walls. Thereafter time to take photos in the neighboring valleys before going back to hotels. After having time for lunch visit Ortahisar Castle, similar to Uchisar Castle in style, where storage caves can also be observed. In the afternoon visit Kaymakli Underground City where early christians lived in fear and faith. On the way back visit to panaromic Pigion Valley where pigions contributed to lives of locals with their manure to fertilize the wineyard. 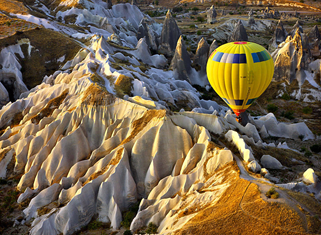 You may also like to taste Cappadocia wine in a local winery. Transfer to the airport in Kayseri or Nevsehir and end of our service.